Review date: 13 June 2000. 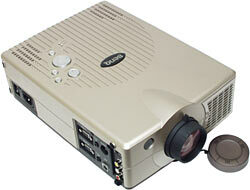 Portable video projectors are now good enough to be used for "proper projector" tasks. They don't have miserable brightness or pathetic resolution any more, and, by projector standards, some of them are quite competitively priced. Acer's 7763P is a case in point. It's an "ultra-portable" unit that weighs only about two and a quarter kilograms (five pounds), and measures a svelte 24 by 19.5 by 6cm (9.5 by 7.7 by 2.4 inches). Actually, the size and weight of the 7763P would make it a "microportable" by some manufacturers' standards. This really is a very small projector indeed, but its magnesium-alloy case means it doesn't sacrifice toughness. The 7763P's recommended retail price is $6499. It's competing with other ultra-portables like Sony's VPL-CS1 (reviewed here), which'll set you back a mere $AU5500 or so. But the 7763P gives you some rather nice features for the extra money. The 7763P has 800 by 600 display resolution - good enough for respectable computer graphics and DVD-quality video. So does the Sony. But the 7763P's display looks rather better, because it uses a different kind of display technology. Unlike most current small projectors, this is a Digital Light Processing (DLP) unit, not a Liquid Crystal Display (LCD) one. DLP is a technology developed by Texas Instruments (see their site about it here). The "Digital Micromirror Device" (DMD) that DLP's based on is one of those things which, intuitively, anybody can see can't possibly work. Like 300 ton airliners, the demonstrable fact that DLP does work is more readily explained as the result of a deal struck with tiny magic goblins. A DMD is a silicon chip covered with teeny little mirrors. Really teeny little mirrors. The 7763P has a single 0.7 inch DMD inside it; its 800 by 600 resolution means that each mirror on the DMD has to be rather less than 20 microns - thousandths of a millimetre - apart. 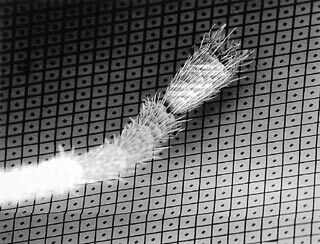 A human hair is about 60 to 80 microns in diameter. This Texas Instruments photomicrograph shows the end of an ant's leg resting on the surface of a DMD. Get the idea? Every one of these minuscule mirrors has a hinge on one corner, and can be tilted up to 20 degrees by a tiny electrostatic motor. The pixels are turned on and off by moving the appropriate mirror; they can be moved incrementally for different brightness settings. Because the mirrors are so tiny, they can move very, very quickly indeed. So quickly, in fact, that only one DMD is needed for full colour projection. A DMD has no inherent colour capability - it's just a configurable mirror array. If you want to do full-colour projection, then, you'd expect that you'd have to use three DMDs and three coloured filters - red, green and blue. But if a single DMD's switched in synchrony with a rotating "colour wheel" - a spinning tri-colour filter that lets through red, green and blue light in turn - then the very rapid switching speed of the DMD lets it lay down red, green and blue images in such fast succession that the result is a perfect colour image. You can do the same trick with a single LCD panel, but it's not a good idea; LCDs are transmissive, rather than reflective, devices, and block something like half of the light that tries to get through them. To maximise brightness in LCD projectors, a three-panel design works better. If you try to pump the entire output of a super-bright lamp through one LCD, keeping it cool becomes rather challenging. The extreme smallness of the moving parts on a DMD mean that it behaves like a solid state device, not a mechanical one. For all their complexity, DMDs have very high Mean Time Between Failures (MTBF), and well-made projectors based on DMDs can be expected to last easily as long as LCD units, and probably longer. If a DLP projector fails, it's not at all likely to be because there's something wrong with the DMD. 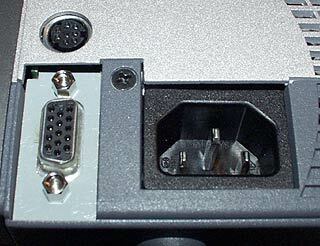 There are only three connectors on the 7763P itself - power, VGA input and the special mini-DIN mouse output connector. The mouse connector works with the rather fancy remote control to let you control your computer remotely; steering a mouse pointer with a remote control joypad isn't very elegant, but it's adequate, and all you need for most presentations is button clicks anyway. 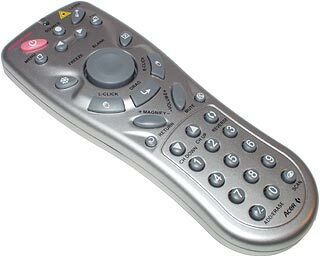 The two engine-vents on the front of the remote aren't just decorative; one is the infra-red LED, one's for the built-in laser diode. A laser pointer isn't exactly a top dollar addition to a remote, when keyring pointers sell for ten bucks, but it's handy to have. You get adaptor cables with the projector to use the mouse output with a PC - serial or PS/2 - or a Macintosh. The 7763P can accept 1024 by 768 input, "compressing" it to 800 by 600. This doesn't look very good, of course - you can't get away from the real resolution of the display system - but it's always nice to be able to use a higher resolution with a projector, if only to reduce the amount of fooling around you have to do with computers you connect to the unit. A 1024 by 768 computer desktop will be viewable and navigable through the 7763P; it might be ugly, but it's a heck of a lot better than a black screen as you set up your plain 800 by 600 presentation. I didn't get to check out the optional extra input adaptors, which plug into the back of the projector, normally covered with a plastic panel. 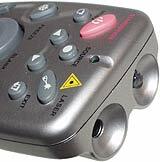 The "Audio/Video Adapter" gives you S-Video and composite inputs - for non-computer video inputs like VCRs or DVD players - as well as a couple of stereo audio connectors. Acer Australia don't seem to have stock of this unit at the moment, but they do have the superior TV Adapter, which has the same features as the A/V Adapter, but a TV tuner as well. The TV Adapter only costs $AU299. Add an antenna, and you've got a take-anywhere shine-on-the-wall multi-function projection system. Other projectors need a handy VCR to serve as a tuner if you want to watch TV, which with the increasing popularity of tuner-free DVD players might be inconvenient for some users. The TV Adapter lets this one do it itself. The 7763P manages a respectable 700 ANSI lumen brightness score - not amazing by modern standards, but excellent for an ultra-portable projector, and adequate for presentations in normally lit rooms. The Sony VPL-CS1's good for only 600 lumens. Like all decent projectors, this one's got a zoom lens, so you can tweak the image size to fit your screen without shunting the projector back and forth. The rated throw distance is 1.8 to 4.5 metres (six to 15 feet), which gives you a 114 to 208cm diagonal image (45 to 82 inches). In contrast, the Sony VPL-CS1 is rated to throw an image up to 150 diagonal inches (3.8 metres); to do this, you have to set it up 6.1 metres (20 feet) away from the screen. This huge image will, of course, be far too dim to view in a normally lit room. The similarly extreme-case image for the 7763P is a 140 inch diagonal, attained at least 8.5 metres (28 feet) from the screen. Again, this is likely to be too dim to be useful, which is just as well, as many meeting rooms aren't big enough for the projector to be this far away from the screen. The closest the 7763P could focus, by the way, turned out to be about 80cm from the screen. But even at maximum zoom-out, that gives you only a 46cm diagonal - or barely more viewable area than you'll get from a 19 inch monitor. Nice bright image, though! 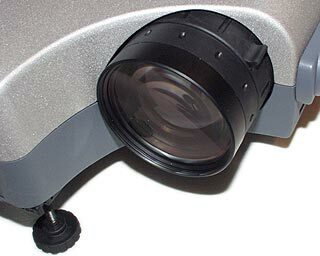 The 7763P's lens. Tiny projectors, with little lenses, generally don't throw as big an image at a given distance from the screen as can larger projectors. Bigger lenses can throw a wider-angled image with less distortion but, ironically, you're more likely to need a wide-angle lens when you're using a teeny porta-projector, because portables more often need to be used in small meeting rooms and other impromptu locations. That said, the Acer's lens lets it down in comparison with the Sony, if image size at a given distance matters to you. The image size difference is quite marked - at a given distance and zoom setting, the Sony will throw an image with about a 50% larger diagonal. In cramped circumstances, that can matter quite a lot. 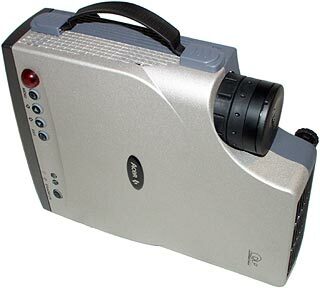 The two projectors' lenses have the same, small, zoom ratio - only 1.3. So the 7763P gives you no more wiggle room than the Sony. Apart from the image size, though, there's nothing to dislike about the 7763P's picture. A nice side-effect of DLP technology is a greatly reduced "mask", compared with LCD projectors. The mask is the black grid around the pixels - the "screen door effect" - which makes the individual pixels stand out plainly, especially when you're using a lower resolution projector. DLP projectors still have a mask, but it's much less prominent. At normal viewing distances, a DLP image looks a lot more like a monitor than an LCD can manage. The simple way to reduce the noticeability of an LCD projector's mask, by the way, is just to wind the projector slightly out of focus. The 7763P's image was also pleasingly free of artefacts - dust motes, scratches and what have you. 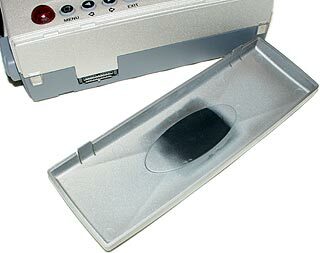 LCD projectors are highly susceptible to dust in the image path, and ultra-portable units don't have the space for good dust filters, and so rapidly accumulate a fine population of glowing greeblies on the image. The glitches are all very out of focus when the projector's focussed properly, so they're usually invisible, but larger ones, especially in the green image path, can show up quite clearly against a dark background. The 7763P I got for review clearly had a fair few miles on it already, but not a glitch could I find. This is a significant advantage, especially if you want to use the projector for the odd movie. The 7763P, like the VPL-CS1, has digital keystone correction. Many small projectors have it these days, and it's better than nothing, but not worth getting excited about. Keystone correction lets you compensate for the wedge-shaped image you get when the projector's angled upwards at a vertical screen. Done optically, it works without significantly reducing the image quality. But doing it optically is expensive. Doing it digitally is cheap, and not nearly as good. Digital keystone correction works by deleting more and more columns of pixels as you get towards the top of the screen - the image loses horizontal resolution as you get towards its "narrow end". For video images, this isn't too noticeable; for computer graphics with sharp vertical detail, it's egregiously nasty. It's a much better idea to use a tiltable screen that can be set up roughly perpendicular to the projector's sight-line, or to just set the projector up on top of a box, or something, and put up with however much keystoning you get. A few degrees of keystoning isn't noticeable at all. 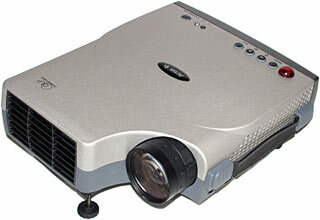 The 7763P's picture has on other advantage over LCD projectors, including the VPL-CS1 - contrast. A display device's "contrast ratio" is the ratio between the brightest and darkest shades it can display. Acer quote a respectable 250:1 "typical" contrast ratio for the 7763P, which is well in advance of the 100:1 that most LCD projectors score, when their makers quote a figure at all. Sony doesn't. LCD projector makers who don't quote contrast ratios usually beg off by saying that there's no standardised way to measure the ratio. Which is true. But that wouldn't stop them from doing a best-case-scenario optimistic test, in the best tradition of marketing benchmarks, and publishing that number. This "full on/off" score is easy to calculate, and is 400:1 for the 7763P. The real reason why LCD projector makers don't like contrast ratios is not because they've got the only honourable marketing people in the world, but because no test, no matter how skewed, will make an LCD projector look as if it's got a contrast ratio that comes within a mile of the results you can get from traditional displays like the venerable Cathode Ray Tube (CRT). Or from a DLP unit, for that matter. The 7763P's blacks aren't black, and they can of course be no darker than the unilluminated screen - that's why the room has to be dark. But when it comes to projecting nothing, DLP does a noticeably better job than LCD. Now, contrast ratio isn't as important as you might think. A lousy ratio can be annoying when you're watching dark and moody movies; if you set the projector so that it shows most of the detail in dark scenes, it'll white-out in light ones. But, generally, you get used to it quickly and it fades into the background, unless it's really awful. But it's still very nice indeed to finally see decent contrast ratios from small, relatively affordable projectors. Depending on which Acer spec sheet you believe, the high pressure short-arc mercury vapour lamp in the 7763P has an estimated lifespan of either 1500 or 2000 hours. Acer didn't have lamp assembly pricing for me by publication time, but no matter; unless the assembly is quite stunningly expensive, the long life of the lamps in all modern small projectors means that you end up paying well under 50 Australian cents per hour of operation. The lamps are quite alarmingly expensive - more than $AU500 for the assembly, generally - but they last so long that it's no big deal. In standard trim, the 7763P loses to various other projectors if you want anything other than plain computer video input, because it doesn't have it. Add the reasonably priced TV Adapter though, and it's got the same input complement as other portable projectors, plus a TV tuner, and a better picture than the whole of the LCD display. Of course, this still isn't a bargain priced projector. You pay for miniaturisation; you can get similar features in a larger (but still portable) projector for a lot less money. And the relatively narrow angle of the lens might be a problem, if you want a big image in a small room. But, if these quibbles don't bother you, the 7763P is an excellent unit. It can turn its hand to anything, it's very easy to move, and it's well priced within its category.